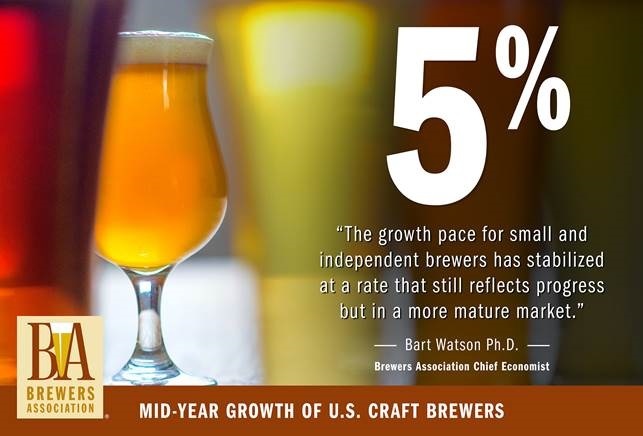 BOULDER, Colo.—Small and independent craft brewers demonstrated continued, but slowed, growth, according to new mid-year metrics released by the Brewers Association (BA)—the not-for-profit trade association dedicated to small and independent American brewers. American craft beer production volume increased five percent during the first half of 2017. Craft brewer definition: An American craft brewer is small, independent and traditional. Small: Annual production of 6 million barrels of beer or less (approximately 3 percent of U.S. annual sales). Beer production is attributed to the rules of alternating proprietorships. Independent:Less than 25 percent of the craft brewery is owned or controlled (or equivalent economic interest) by an alcoholic beverage industry member that is not itself a craft brewer. Traditional: A brewer that has a majority of its total beverage alcohol volume in beers whose flavor derives from traditional or innovative brewing ingredients and their fermentation. Flavored malt beverages (FMBs) are not considered beers.